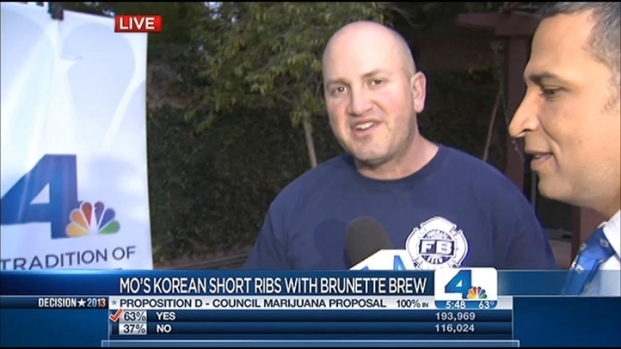 "Fireman's Brew" Recipes As Seen On "Today in LA"
coat. Let sit for 10 minutes while preparing marinade. •	Whisk together remaining ingredients in a bowl. Fireman's Brew On "Today in LA"
Mauricio Benard and Robert Nowaczyk from "Fireman's Brew" stopped by "Today in LA" to share some hot recipes for the Memorial Day weekend. This clip is from "Today in LA" on May 22, 2013. •	Refrigerate for at least 4 hours, but preferably overnight. •	Heat grill to medium-hot. •	Grill short ribs for approximately 3-4 minutes per side. •	Garnish with thinly sliced green onions if desired. garlic salt, parsley and pepper inside and out. •	Insert chopped onions and garlic inside and set aside. the can on a baking sheet and insert into the bird's cavity. •	Place the bird with the can on the grill in the center of the sheet making sure it is balanced on its legs. •	Cook over medium heat with the BBQ cover closed for about an hour checking the internal temperature until it reaches 165 degrees F or until the juices are clear. •	Remove from the BBQ and allow it to rest for 10 minutes before serving. •	Heat Olive Oil in a large skillet over medium-high heat. Add vegetables, season with garlic salt, black pepper and soy sauce to taste. Sauté until tender yet crisp (approx. 5 min.) Remove vegetables from skillet and reserve. •	Preheat a grill to medium-high heat. Grill the chicken and steak. Remove from grill, cut into strips and reserve. •	Heat the same large skillet until very hot and return vegetables to the pan. Layer the assorted roasted chilies on top and then add the meat. Add lime juice for that famous fajita sizzle and serve immediately with guacamole and salsa.